The Navy’s robotic fighter just got one step closer to earning its wings. The X-47B, an unmanned stealth attack jet, has completed the first major phase of flight testing on its way to become the first aircraft to be able to land and take off from the deck of an aircraft carrier –completely autonomously. After its first successful flight on February 4, 2011 at Edwards Air Force Base – a short, 29 minute jaunt to 5,000 feet – the X-47B has now climbed to as much as 15,000 feet. The testing, which concluded on May 15, ran the jet through multiple maneuvers that are essential for using an aircraft carrier as its base of operations including extending and retracting a tail hook needed to catch the carrier’s arresting wires upon landing and “touch-and-go” landings. The testing is a continuation of the Navy’s Unmanned Combat Air System Carrier Demonstration (UCAS-D) program, a collaboration between the Navy, Northrop Grumman, which built the aircraft, and the U.S. Air Force Flight Test Center. The next phase of the program will be carried out at the Naval Air Station at Patuxent River, Maryland, to where the X-47B has already been transported (causing some locals to wonder if they’d seen a UFO). Of course, landing on a carrier at sea can be hairy business. The X-47B will prepare for mishaps with “bolter” runs in which its tail hook fails to snag an arresting wire and it has to immediately take back to the air. And it’ll practice wave-off performance in which it receives a command to abort a land attempt. The program will continue while the X-47B’s carrier-based operations are perfected. And, if it hasn’t already capturing the world’s attention with its technical feats, it will add another trick: autonomous aerial refueling will be demonstrated sometime in 2014. Initiated in 2007, the UCAS-D program’s goal is to add an “unmanned air system capable of providing persistent, penetrating surveillance, and penetrating strike capability in high threat areas,” the Navy said in a press release. The prospect of aerial refueling means the robot fighters could stay in the air for extended periods of time, flying one preprogrammed mission after another. 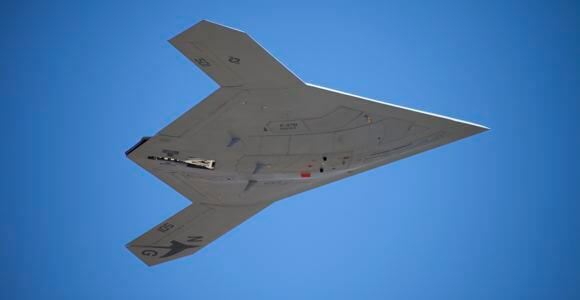 With its tailless design that makes it harder to detect with radar, a fleet of autonomous X-47Bs would be a powerful addition to the US Navy. Landing on the flight deck of an aircraft carrier is a difficult task for a human Navy pilot. A motionless runway is a far cry from a pitching and bobbing waterborne flight deck. It remains to be seen if the X-47B is up to the task. But so far it’s been a smooth ride, and as the X-47B draws closer to gaining a foothold on US carriers, it also helps to usher in a new age of warfare that is becoming increasingly robotic.